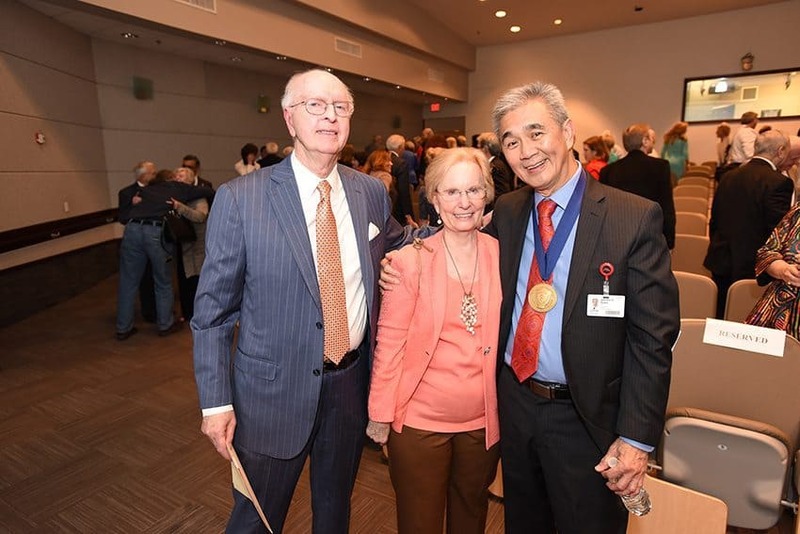 James Y. Suen, M.D., (right) was named the inaugural recipient of an endowed chair made possible by Patricia and J. Floyd Kyser, M.D. May. 13, 2016 | LITTLE ROCK — James Y. Suen, M.D., has been named the inaugural recipient of the Patricia and J. Floyd Kyser, M.D. Chair in Otolaryngology-Head and Neck Surgery at the University of Arkansas for Medical Sciences (UAMS). Patricia and J. Floyd Kyser, M.D., of Little Rock, are the benefactors responsible for the establishment of this chair. It will be used to advance Suen’s internationally recognized work in head and neck surgery. Suen trained under Kyser as an otolaryngology resident in the 1970s. James Y. Suen, M.D., surrounded by his family following the ceremony. 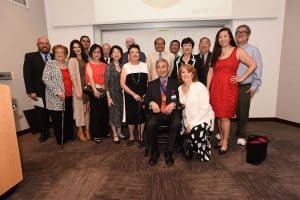 Suen was invested in the chair in a ceremony May 12 held in the Sam Walton Auditorium in the UAMS Winthrop P. Rockefeller Cancer Institute. Guests included former U.S. Sen. David Pryor and University of Arkansas Board of Trustees member Ben Hyneman. 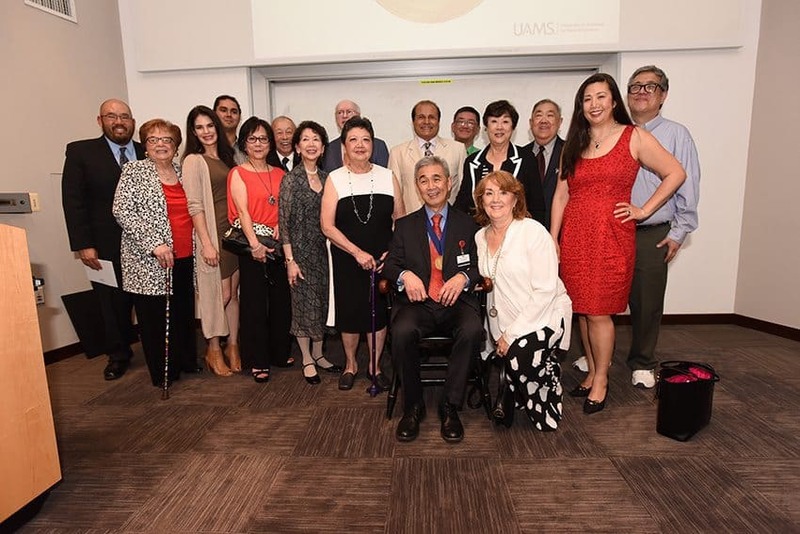 “This generous gift from Dr. and Mrs. Kyser will ensure that the legacy of outstanding head and neck clinical care and medical education started by Dr. Suen more than 40 years ago will continue to grow and flourish for many years to come,” said UAMS Chancellor Dan Rahn, M.D. “We are so fortunate to have both the tremendous support of the Kysers and the expertise of Dr. Suen here at UAMS. While countless trainees and patients have benefited from his knowledge and skills, Dr. Suen also is widely respected for his genuine compassion and dedication to his patients. 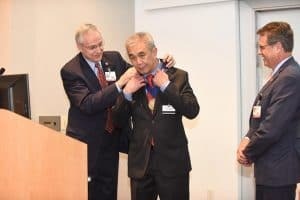 Together, these qualities make him one of the most beloved and respected physicians in our state,” said Peter Emanuel, M.D., director of the UAMS Winthrop P. Rockefeller Cancer Institute. He credited Kyser with teaching him many things in and out of the operating room. Gresham Richter, M.D., chief of pediatric otolaryngology and associate professor in the UAMS College of Medicine’s Department of Otolaryngology-Head and Neck Surgery, also spoke at the ceremony. “Dr. Suen is innovative in taking a patient who has no other hope and trying to find a way to fix the problem,” Richter said. Floyd Kyser, M.D., who grew up in Camden, served an internship at UAMS after graduating with honors in 1962. He then was drafted into the Army where he was assigned to the Ear-Nose-Throat Department at Fort Benning, Georgia. Following his discharge, Kyser trained in general surgery for a year at the University of Missouri and then completed a residency in otolaryngology-head and neck surgery at Southwestern Medical School and Parkland Hospital in Dallas. In 1969, Kyser and his wife, Patricia, returned to Little Rock, where he established a solo practice and worked for 32 years until his retirement in 2002. Two of the Kyser’s four children also are graduates of the UAMS College of Medicine. Kyser is an active alumnus in the UAMS College of Medicine and the college’s Founders Society, serving as president of the philanthropic organization’s executive committee in 2005-06. He served on the UAMS Foundation Fund Board for nine years, and is a member of the Society of the Double Helix and the Chancellor’s Circle. Also a graduate of the UAMS College of Medicine, Suen has served as chair of the UAMS Department of Otolaryngology-Head and Neck Surgery for the past ­­­41 years. He is co-founder and former director of the UAMS Winthrop P. Rockefeller Cancer Institute. Suen’s primary interests are the treatment of head and neck cancer and the management of vascular anomalies, for which he established a treatment team that is internationally known. He is the co-editor of seven major textbooks, including four editions of Cancer of the Head and Neck, which are used in universities around the world. He has published more than 150 scientific articles and book chapters and received multiple awards, including the Distinguished Professor Award and Distinguished Faculty Service Award from the UAMS College of Medicine. He also received the Distinguished Alumnus Award from the M.D. Anderson Cancer Center in 1994-95. Suen served as the personal physician for President Bill Clinton during his presidency and continues to treat him. He has been listed in every edition of Best Doctors in America, Castle Connolly’s America’s Top Doctors for Cancers, and Top Surgeons in the United States, and he was named to the 2015 Newsweek Top Cancer Doctors in the United States.